The Suffolk Regiment has a 274 year history, and was originally raised by the Duke of Norfolk in 1685, as the 12th Regiment of Foot, to suppress the threatened Monmouth Rebellion. Their first stations were at Great Yarmouth and Landguard Fort in Ipswich. King James II was a Catholic King and many of its original officers were Catholics but when he fled to France, the whole army, including this Regiment, would not support him further. Their first actions were to be in Ireland actually fighting against James. They stormed Carrickfergus Castle and were in the Battle of the Boyne on 6th July 1690. Gradually the links to Suffolk strengthened as more and more recruiting was done in this County. In 1782 it became the East Suffolk Regiment but the Depot of the Regiment was finally established at Bury St Edmunds in the Gibraltar Barracks in 1878. 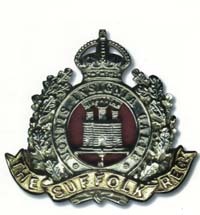 The official title became the Suffolk Regiment in 1881. The West Suffolk Militia became the 3rd Battalion and the Cambridgeshire Militia became the 4th Battalion. By 1900, 90% of the men came from Suffolk. The 4th Battalion of the Territorial Force (later the TA) was established in 1908 in East Suffolk and the 5th Battalion in West Suffolk. On 27th June 1743 the Regiment fought against the French in the Battle of Dettingen, the last battle in which an English King (George II) led troops into the fray. Today the Suffolks will still wear a rose when the Sovereign is on parade or on the Sovereign's birthday in memory of Dettingen. The motto "Stabilis" or "Steady" was also adopted at this time from the personal arms of the Colonel of the Regiment at Dettingen. Ensign James Wolfe served with the Regiment at Dettingen, aged 16 and was promoted to Adjutant for his conduct there. He was later to become famous as Wolfe of Quebec in 1759. One of the most famous of the Regiments' engagements was on 1st August 1759 at the Battle of Minden. Six British regiments, including the 12th Foot on the right of the leading line marched through withering cannon fire, repulsed six elite French cavalry charges and did this alone and unsupported because of a series of unfortunate circumstances. Sheer determination and steadyness won the day, and the soldiers plucked roses to decorate their hats. Today Minden Day is still commemorated by a parade and the wearing of a red rose and a yellow rose. The memory also survives in the name of the "Minden Rose" inn not far from Gibraltar Barracks and Blenheim Camp. The Minden Day parade in 1997 included Martin Bell, MP who was from Beccles and did his National Service with the Suffolks. The Regiment was stationed in Gibraltar for 14 years from 1769 to 1783, and was involved in the Siege of Gibraltar by the Spanish and French from 1779 to 1783. On 17th November 1781 the Siege was broken by a Grand Sortie and its main body was 12th of Foot. For services in the siege the Regiment took the arms of Gibraltar as its crest and the Castle and Key were part of the cap badge and colours from then on. This remains as part of the Royal Anglian Regiment badge today. From 1823 to 1834 the Regiment returned to Gibraltar. The times were peaceful, but there was a severe outbreak of fever in this period. In 1878 when a new Depot was built at Bury St Edmunds it was known as Gibraltar Barracks. From 1797 to 1809, the Regiment saw severe fighting in India, starting with the war against Tippoo Sultan, ruler of Mysore, and the storming of Seringapatarm on 4th May 1799. More fighting occurred in Southern India with the Rajahs of Travancore and Cochin. 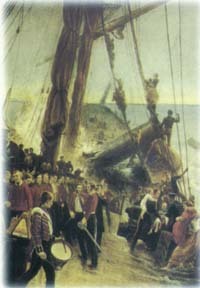 South Africa and the Wreck of the "Birkenhead"
In 1842 the Reserve Battalion was formed and in 1851 it was sent to South Africa for the Kaffir Wars. In 1852 a draft of one sergeant and 79 private soldiers of the First Battalion were sent to join them on board HMS Birkenhead. They were shipwrecked off the Cape on 24th February 1852 and stood steady on parade on deck as the ship went down, to allow the women and children into the lifeboats. The famous expression "women and children first" arose following the widespread admiration of this event, when 55 soldiers were drowned. There is a memorial to these men in St Mary's Church, Bury St Edmunds. When the Reserve Battalion returned to England in 1858, it became the Second Battalion of the Regiment. In 1854 the First Battalion went to Australia and in 1860 two companies were sent to New Zealand to fight the Maoris. This continued until the Battalion returned to England in 1867. The Royal Anglians still retain links to a Regiment in Australia and one in New Zealand resulting from this period, although the long hair and moustachios adopted in New Zealand were more short lived. From 1864 to 1907 there was always at least one battalion serving in India. There is a brass plaque in St Marys Church, Bury St Edmunds, commemorating 266 officers and men of the Second Battalion who died in India from 1864 to 1878. The First Battalion was soon involved in the Second Afghan war which lasted from 1879 to 1881. In 1873 the British Army was reorganised by Edward Cardwell, the Secretary of War. The Regiment became part of the 32nd Military District with Headquarters and Depot in Bury St Edmunds. The Cambridgeshire and West Suffolk Militia were also formally incorporated. In 1878 the Keep at Gibraltar Barracks, Bury St Edmunds was built. The Keep still remains, but the rest of the Barracks now contains open space, the Bury Leisure Centre and the West Suffolk College. 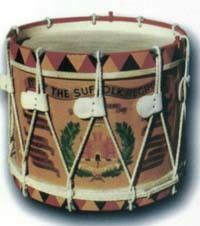 In 1881 the Regiment became called the Suffolk Regiment at last, and by 1900 90% of the men came from Suffolk. The West Suffolk Militia became the 3rd Battalion and the Cambridgeshire Militia became the 4th Battalion. The First Battalion was in England when the South Africa War broke out and was mobilised and sent to the Cape. Their first battle was to assault a hill near Colesburg in January 1900 with heavy losses. The Boers gave the area the name of Suffolk Hill in recognition of their courage, and the three years of war led to the Battle honour of "South Africa 1899 - 1902". In 1908 the Territorial Force was formed. It was the forerunner of today's Territorial Army. It was set up on County lines and the 4th Battalion was established in East Suffolk at Ipswich and 5th Battalion in West Suffolk at Bury. Britain entered the war on 4th August 1914, and the Second Battalion was in France with the British Expeditionary Force by the 17th. By the 25th August they joined other Battalions to stand as rearguard at Le Cateau and were overrun after 9 hours with losses over 700. They fought in all the major battles in France for the rest of the war. A notable action came on 28th March 1918 at Wancourt (1st Battle of Arras 1918) during the great March offensive by the Germans. Two companies, cut off and surrounded, fought back to back on the Wancourt - Tilloy Road to hold up the German advance, under Captain W Simpson of Bury and Captain L Baker from Lavenham. The First Battalion arrived from South Africa in 1915 and was involved at Ypres and in May lost 400 casualties. Some time later they were moved to Macedonia. The 4th Territorial Battalion fought at Newe Chapelle in 1915 and was in battle for the rest of the war. The 5th Battalion (TF) was in Gallipoli in 1915, then in Palestine in two Gaza battles. Also there were the Suffolk Yeomanry which became the 15th Battalion in 1915 and went on to serve on the Western Front. In total, 23 new Battalions of the Suffolk Regiment were raised during the Great War and two VC's were awarded. Sergeant Saunders of the 9th Battalion received his VC for action at Loos in September 1915 and Corporal Day of the 11th near Peronne in 1917. In 1922 the First Battalion took part in opposing the Moplah Rebellion in Malabar, India. Via Gibraltar again it returned to England in 1927 where it marched throughout Suffolk on a recruiting campaign. Parades were held in Ipswich, Stowmarket, Bury and Sudbury, and it was in Britain until 1939, with a short tour in Malta. The Second Battalion was in Gibraltar until 1927 when it was sent to Shanghai and on to India in 1929. It was on the North West Frontier by 1939. Blenheim Camp was built early in 1939 in Out Risbygate, Bury St Edmunds, and was originally known as West Lines. It was built for training the Militia who were called up for a six month spell, but war broke out before the six months were up. West Lines was expanded to give basic training to new recruits throughout the war. After the war, the Bedfordshire and Hertfordshire Light Infantry were stationed here. Blenheim was one of their battle honours and so the name of West Lines was changed to Blenheim Camp. Today, Blenheim Camp is much reduced in size, and much of its area is covered by houses, but it is still a depot for the Territorial Army. The First Battalion was sent to France with the 3rd Division of the British Expeditionary Force and fought in France and Belgium in 1940 and was evacuated from Dunkirk. It returned to France on 6th June 1944 at Sword Beach, Normandy and eventually recovered the Battalion's drum which had been hidden at Roubaix in 1940 during the retreat. On 28th June 1944 it captured the Chateau de la Londe, near Caen, with 161 casualties. The Battalion fought its way to Brinkum, near Bremen via Sannerville, Banneville, Overloon and Venraij in the Netherlands. The Second Battalion was on the North West Frontier but moved to the Arakon and Imphal Campaigns in Burma where the clearance of Japanese Bunkers 'Bamboo' and 'Isaac' were notable actions. The 4th and 5th Battalions were raised as a prelude to this war and were assigned to the 18th Division sent to guard Singapore when Japan entered the war. When Singapore was lost, these men were to become Prisoners of War and memories of Changi Jail and the building of the Burma Railway under intolerable conditions remain a powerful part of local history. Many men did not survive this period of slave labour. The 7th Battalion was converted to armour to fight in the Churchill tanks of 142 Regiment Royal Armoured Corps. They fought in the Battle for Tunis and the clearance of Tunisia, and the break through the Adolf Hitler line at Cassino in Italy. Here they fought alongside Canadian troops and wore the Canadian Maple Leaf badge. In 1944 the Suffolk Regiment was granted the Honorary Freedom of the Borough of Bury St Edmunds. Up to this time this honour had only been bestowed upon notable individuals. The Second Battalion remained in India after the war until May 1947 when it was returned to Bury and effectively stood down. The First Battalion was in Palestine trying to keep the peace from 1946 to 1948. In 1948 it was in Greece and in 1949 in anti-terrorist operations in Malaya, where they were judged to be very successful, with several decorations being earned. In 1953 they went to Trieste where Italians and Yugoslavs were disputing the sovereignty of the city, and in 1954 to Germany as part of the occupation. In 1956 more anti-terrorist action was needed in Cyprus and in 1958 the Regiment became part of the East Anglian Brigade. The 4th Battalion came into being again in 1947 as part of the Territorial Army with companies all over Suffolk, and one in the Isle of Ely. On 29th August 1959 the First Battalion Suffolk Regiment amalgamated with the First Battalion Royal Norfolk Regiment to form the First Battalion, the First East Anglian Regiment. In 1963 the First East Anglian Regiment, was granted the Honorary Freedom of the Borough of Bury St Edmunds to continue the strong local links. Its successor is the Royal Anglian Regiment, and the First (Royal Norfolk and Suffolk) Battalion retains this honour today. In 1953 the 358 (Suffolk Yeomanry) Medium Regiment RATA was granted the Honorary Freedom of the Borough of Bury St Edmunds. This honour was also granted to The Norfolk and Suffolk Yeomanry (as reorganised in April 1967) in 1967.